Keeping jellyfish as pets is still in its infancy. You can't just stroll into a national pet store chain or the closest specialty fish shop and purchase a jellyfish aquarium. Nor can you find jellyfish for sale even at the biggest online fish retail websites. So what good is a jellyfish tank if you can't even buy jellyfish to go in it? These are the problems often faced by entrepreneurs looking to market a product that was previously nonexistent. The answer is that you have to become the "end all & do all" of the niche market you are looking to cater to. To the best of is knowledge, there are only two companies in the US that have been able to successfully accomplish this. Jim Stime had ten years in the aquarium business selling Clear-For-Life aquariums in L.A. before entering the jellyfish arena. Jelliquarium went live in 2002 and is the longest running website in the US offering jellyfish and jellyfish tanks. The term jelliquarium is a registered trademark. Jelliquarium offers self-enclosed, freestanding Kreisel style tanks. Kreisel style tanks are not cheap to manufacture and this is reflected in the sales price. But Jelliquariums's traditional porthole aquarium cabinets are truly a wonder to behold. The jelliquarium's patent-pending faceted tank design employs state-of-the-art laminar water flow to keep your jellyfish safely suspended just like the original Kreisel design. Jellyfish cabinets feature a 3-in-1 filtration system utilizing mechanical, chemical, and wet-dry biological filter technology. Dual 1" flexible water flow lines allow for quiet water circulation throughout the cabinet. An optional venturi protein skimmer is available for maximum water clarity. Jelliquarium also offers an Aqualogic aquarium chiller for cold water jellyfish applications. Aqualogic chillers use only ozone-friendly 134A refrigerant. Their cabinets arrive prevented for easy heat expulsion from the chilling unit. Jelliquarium cabinets also feature digital thermostat controlled heating and both blue Actinic and white lighting standard on every model. The LCD controller on the digital thermostat provides a constant readout and can be programmed in either Fahrenheit or Celsius. Cabinet sizes are currently available in the 24" mini-jelliquarium and the full size 32" models. The mini jelliqaurium is available in black. The 32" cabinet comes in a vast array of finishes from laminate cabinets to a variety of wood finishes to compliment any home or workspace decor. Jelliquarium cabinets are also available in gigantic 48" models. Jelliquaium will also design and install custom in-wall setups for both commercial applications and private residences. If you are an avid DIY type with prior experience in saltwater aquarium set up you can also buy just the jelliquarium tank. Tank sizes range from 24-60". The 24 and 30-inch tanks can be set up for tabletop use. Serious do-it-your-selfers can build their own custom in-wall jellyfish tank ranging up to 60" in size. The Jelliquarium staff will gladly provide any technical advice necessary for an advanced DIY enthusiast. The 24 and 30" jelliquarium tanks make the perfect biosphere for pet moon jellyfish and blue jellies. 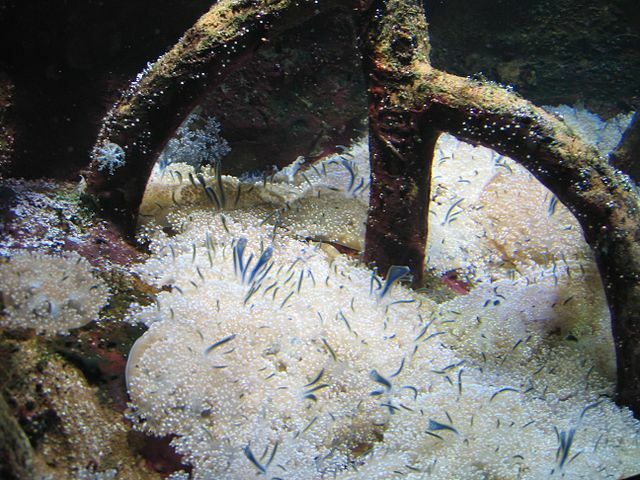 Larger tanks can accommodate species such as Pacific sea nettles. Jelliquariums offers the largest assortment of jellyfish available for US customers on the internet. This selection is based on availability. Jellyfish are cyclic in nature. Most jellies enter the adult phases of their life in the spring or summer months of whichever hemisphere they are native to. It is highly likely that seasonal availability will become year-round as more species start being tank raised. Moon jellyfish have translucent bodies. They look absolutely amazing with an array of fading LEDs shining through them. You can now buy a Jellyfish Aquarium Fish Tank to raise your own pet jellyfish in. You can even light them up just like they are in the big public aquarium jellyfish exhibits. Moon jellies are by far the most easily obtainable jellyfish on the market. Moon jellyfish are even being tank raised to supply the rising demand of home aquarium owners. Written by Stephen J Broy - Learn more about Moon Jellyfish and other Pet Jellies. Upside down jellyfish (Cassiopeia xamachana) is another member of the order Rhizostomae. The species name, xamachana, means Jamaican although their natural habitat is in no way exclusive to Jamaican waters. Populations exist throughout the Gulf of Mexico and Caribbean as well as along the coats of Florida. They are also present halfway across the globe in the Pacific Ocean. Although not native to these waters, upside down jellyfish were introduced to the Hawaiian Islands during World War II most probably from jellyfish polyps attaching themselves to the underbellies of warships coming back from the Philippines. This species is prevalent in shallow, warm tropical waters such as mangrove swamps. They are often called mangrove jellyfish because they are frequently found in large aggregations in these swampy regions. Unlike many species of jellyfish, upside down jellies are completely marine. None have been found in brackish or fresh waters. These jellies spend their lives completely differently than most jellyfish. Jellyfish typically spend much of their time drifting freely on the ocean's currents. Upside down jellyfish are free swimming until they reach about 2 cm. Then their bell inverts and they sink to the bottom of the ocean floor. From there they will spend the majority of their adult life upside down on the muddy substrate with their tentacles pointed up to capture the ever-present zooplankton from water columns. Much like blue jellies, upside down jellyfish have a symbiotic relationship with zooxanthellae. This is the same symbiosis that occurs with many jellyfish and coral species. In addition to providing essential nutrients, these golden algae also produce oxygen to help support respiratory metabolic functions the jellyfish needs to survive in oxygen-poor environments. This is of particular importance to upside down jellyfish because they spend the vast majority of their life nestled in muddy substrate and must rely on their food to come to them. Because of their specialized eating habits, upside down jellyfish are usually found in nutrient-rich waters with high concentrations of decaying matter to support the zooplankton teaming within these swampy, saltwater environments. Upside down jellies have flat, saucer-shaped bells. Their umbrellas are typically greenish grey or blue in colour. They have a central depression or exumbrella in their bell. The exumbrella acts as a suction device to help them stay anchored to the ocean floor. Rather than a single mouth opening, they have 4 elaborately branched oral arms. These arms have a frilly, lace-like appearance similar to many green, leafy vegetables. They are often referred to as cabbage-head jellyfish because of these appendages. It is believed that this species a filter feeder and also relies on some form of absorption of dissolved nutrients directly from the water to supplement its nutritional needs. The jellyfish's cnidoblasts also function as a self-defence mechanism. If abruptly disturbed, large groups of these jellies will launch themselves upward from the ocean floor and release their nematocysts. This massive venom release into the water is usually sufficient to ward off potential predators. The toxic compound is generally inconsequential to human beings. It may result in an itchy or tingling sensation of the skin or a rash on individuals more sensitive to the venom. Upside down jellyfish can reach up to 14 inches in diameter in the wild. In captivity, a maximum growth potential of 8 inches is more realistic. Depending on their size in captivity, upside down jellyfish can be fed zooplankton, or small invertebrates and fish. In order to allow their symbiotic algae to properly photosynthesize, a lighting system conducive to a marine reef tank is highly recommended. These jellies have a higher temperature tolerance than most scyphozoan medusa. Medusae or adult jellyfish can be found year round. However, the optimum temperature for these adult jellies is between 75-78 F. This simulates the height of the adult season. Upside down jellyfish typically strobilate during summer or early fall. Whereas most scyphozoans strobilate during the winter months. Jellyfish have survived for 650 million Years. They belong to the phylum Cnidaria. This phylum is divided into definitive classes which include all anemones, corals, fire corals and what is commonly referred to as true jellyfish. Anthozoa contains sea coral and anemones. Hydrozoa includes the Portuguese Man o`War which contrary to popular belief is not an actual jellyfish but a massive colony of hydrozoans. The class Cubozoa contains box jellies, the deadliest creatures on Earth. True jellyfish belong to the class Scyphozoa which includes over 200 species. Jellyfish exist in every ocean on the planet. They cover the entire spectrum of oceanic depths from shallow estuaries and lagoons to the deepest, largely unexplored regions of the aquatic domain. The most geographically diverse and easily recognizable of these creatures is the moon jellyfish (Aurelia) or common jellyfish which contains twenty separate species that are so identical morphologically that it takes DNA testing to distinguish one form another. From a non-scientific standpoint, moon jellyfish might as well be a single species. Anatomically, jellyfish can best be described as a sac within a sac. They are composed of approximately 95% water, 3% salt and 2% protein. They have no eyes, no brains, and no supporting skeletal system but yet are one on the oldest multi-cellular creatures known to man. They existed long before the first dinosaurs roamed the Earth and will almost certainly still be here long after the human race has vanished. Without a brain, jellyfish have managed to survive three planetary wide extinctions: This alone bears testimony to their long term survivability as a life form. Jellyfish are one of the simplest multi-cellular organisms in existence. They are most accurately described as gelatinous zooplankton. The actual term jellyfish is a universal misnomer. Jellyfish are, of course, not fish. Jelly refers to the gelatinous substance that accounts for most of the mass in a jellyfish's umbrella or bell. This jelly (mesoglea) is surrounded by two layers of epithelial cells. The top layer forms the upper portion of the umbrella. The bottom layer forms the subumbrella or underbelly of the bell. Jellyfish do not have specialized digestive, respiratory or circulatory systems. In fact, they don't even have blood cells. Oxygen is absorbed by simple diffusion through their thin outer membranes. A second membrane within the jellyfish contains a gastrodermal lining which forms a gastrovascular cavity. This primitive cavity functions in place of a digestive system. Nutrients are absorbed and distributed throughout the body. Jellyfish either have a single mouth or multiple mouth openings positioned on oral arms that function for both intake of nutrients and expulsion of waste products. Jellyfish also lack any semblance of an advanced skeletal system. They have what is called a hydrostatic skeleton that provides structural integrity and allows for limited mobility. Hydroskeletons are common in many lower life forms, specifically cold blooded and soft bodied organisms. A hydroskeleton consists of fluid or gelatinous filled cavity called a coelom. The coelom is typically surrounded by muscular tissue or muscle-like membranes. As the muscle tissue contract or expand the pressure of the fluid in the coelom is changed. This change in fluid pressure is what allows jellyfish to change shape and achieve locomotion. Most jellyfish are poor swimmers. They spend the vast majority of their adult lives drifting haplessly on the ocean currents. Box jellies, however, are quite good swimmers. Sea nettles are such accomplished swimmers that they spend most of their time swimming, quite frequently against prevailing currents. This is why they appear to be swimming upside down. Moon Jellies are by far the most readily obtainable jellyfish on the market. They are being tank raised to supply the rising demand for pet jellyfish in America. Their translucent bodies look absolutely amazing with an array of fading LEDs shining through them. You need a special Jellyfish Fish Tank Aquarium to keep jellyfish in. Learn more about Moon Jellyfish and other Pet Jellyfish.